Does your commercial property need a new roof? Metal roofing panel installation might just be your best bet. Metal roofs look great when they’re installed properly and will really bring up the aesthetic appeal of your entire business. There are many other benefits that come along with installing a metal roof, too. Here are some of the ways metal roofing panels will prove to be beneficial to you and your business. Metal roofs last longer than other roofs. When you install a commercial roof, you don’t want to have to worry about replacing it anytime soon. And you won’t have to with a metal roof. While the exact lifespan of a metal roof depends on how you care for it, it’s not uncommon to see metal roofing panels last for more than 50 years. They’re also more durable than other roofs and require less maintenance. 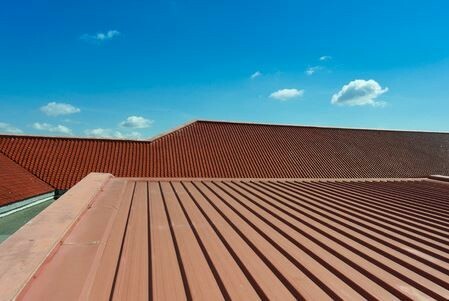 One of the reasons metal roofs last so long is because they’re incredibly durable. They can withstand high winds and other weather conditions and can even resist fire in most instances. Additionally, you won’t have to do much maintenance to metal roofs after you have them in place. They won’t show any signs of wear and tear over the years and will stay put for years to come. They’re sustainable and can be recycled when you’re done with them. Other types of commercial roofs end up in landfills once they need to be replaced. That’s not the case with metal roofs. After you’re done with a metal roof, you can have the panels from it recycled. You can also rest assured knowing that most metal roofs are made from recyclable materials. They’re better for the planet than your other roofing options. If you want to find out if a metal roof is right for your commercial property, Ray Roofing Supply can provide you with more information on our metal roof panel installation. Call us at 330-452-8109 today to have a new metal roof installed.